The drought that plagued much of the Midwest in summer 2012 has had a marked impact on agriculture supply and, consequently, food prices, placing an inordinate amount of pressure on supply chains to squeeze out as much extra cost as possible. While much of the news has been gloom and doom, some glimmers of progress are emerging—especially on the transportation side. North Dakota has experienced a commodity-driven bonanza over the past few years with the oil field rush in the Bakken shale and Three Forks formations, and its established reputation as one of the top wheat-producing U.S. states. It has also become a hub for containerized rail movement thanks to an initiative spearheaded by BNSF Logistics. 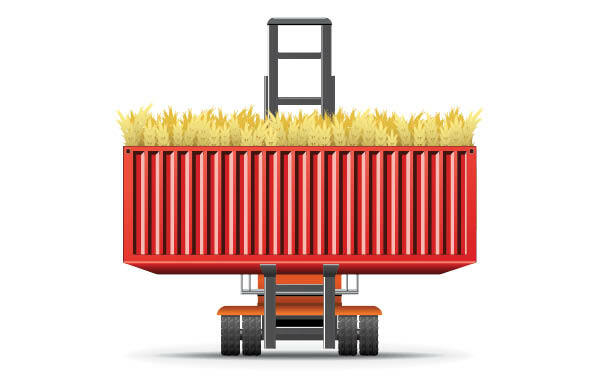 The third-party logistics provider has been working with North Dakota Port Services, BNSF Railway, Ocean Carrier Partners, and agricultural and oil field shippers to put in play its "ag in a box" solution. The service does exactly what its name suggests—moving containerized agriculture for export to Asia while bringing back oil and gas commodities such as frac sand. In effect, BNSF Logistics has engineered a closed-loop supply chain solution for the region's two strongest industries.